Out of the hundreds of thousands of Old School players out there only around 150 have done what it takes to accomplish level 99 in every skill. This is no small accomplishment and, as such, a cape that lets this small group of elite players show off their top tier status is now available. If you are one of the few maxed players in game, grab yourself a pickaxe and hatchet and head out the back of the Warriors' guild. An odd NPC, Mac, may be willing to sell you one of those fancy max capes. The cape costs 2,277,000 coins to purchase from Mac. It has the stats of a trimmed skillcape with a unique appearance and skillcape emote. If you catch a player wandering around with one of these beautiful new capes, enjoy it while you can. It won't be often you see one knocking about! A new spell is now available on the Lunar spellbook: Geomancy. It requires 65 Magic, 3 Astral runes, 3 Nature runes and 8 Earth runes to cast. 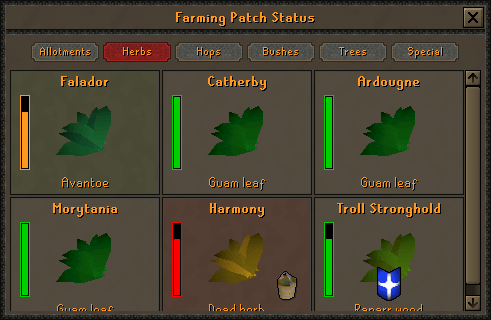 Upon casting Geomancy an interface will open that will allow you to see the status of almost every farming patch in Old School, with farming patches that are only used during quests excluded. Please note: The Geomancy spell has been placed at the bottom of the spellbook rather than in level order to preserve the position of the vengeance spell. We expect to poll options for customising your spellbook appearance in the future. Those of you fond of Impetuous Impulses will be pleased to hear that you can now track your impling catches using an option found on the butterfly net. 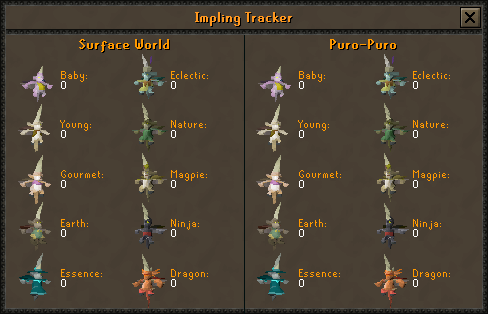 The impling tracker will show you both the number of implings caught inside Puro-Puro and out around the surface world. Zulrah's attack sequences now have a little more variety since they were too predictable, and it now drops fewer teleport scrolls since those were coming into the game faster than they could be used. The Abyssal Sire drop table has been improved. The emotes list has now been rearranged so the Drill Demon emotes are no longer at the bottom of the list. It is no longer possible to spawn multiple Uri’s. The Canifis pub now has a minimap icon. Added blocking to the various rocks and stalagmites found within the Kalphite Lair. Removed the teleport option from Kandarin headgear 1 & 2 as it served no purpose. Added some dialogue to Captain Bleemadge. The Flax Keeper has been given more appropriate dialogue for when you attempt to claim your daily free flax before completing the Kandarin diary. Resolved a graphical issue within the Asgarnia Ice Dungeon. The Rogue's Den wall safes have been added to the Thieving skill guide. The examine text for the Smoke battlestaves has been updated. Repaired some grammar in the hunter master's dialogue. Fixed the spacing in the examine info of an undead chicken. Added the apostrophe to Seers' village in the elemental workshop quest journal. Removed several occurrences of full stops following a question mark in dialogue. 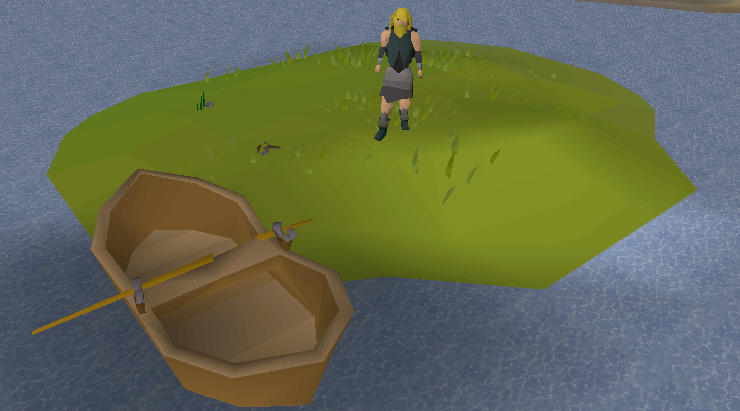 Exhausted is now spelled correctly when attempting to use the explorer's ring. Epic. The max cape is finally here Good job on the cape. Credit to Mod Alfred for the GFX, with code from Mod Maz to plug it all in. "Fixed the spacing in the examine info of an undead chicken." Are the forums reinforced for the reaction to this: "Zulrah's attack sequences now have a little more variety, since they were too predictable"
When should we be expecting the Halloween event and skilling pets? Good job with that geomancy spell....its not like we have OS buddy to observe our farm patches...for free. Halloween's likely to come out at the end of the month. Skilling pets were queued behind the max cape, but can now get some GFX time, so I'd expect to see them this month too.